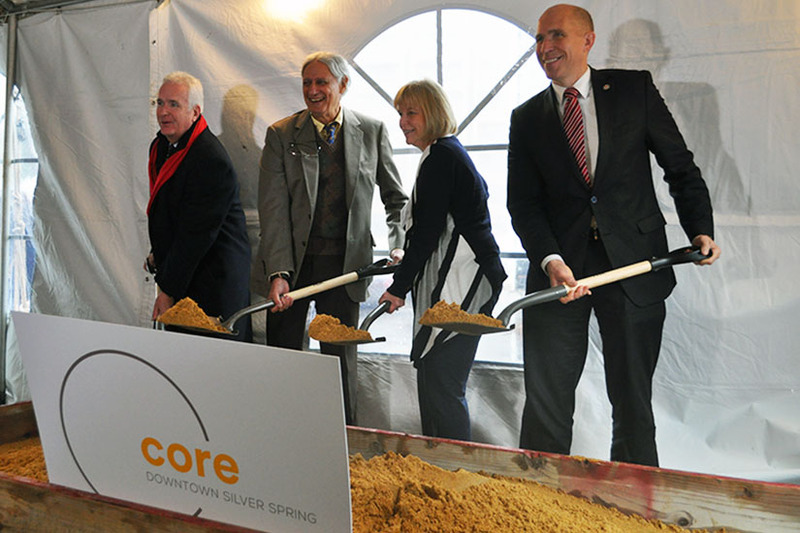 Development companies Foulger-Pratt and Willco broke ground Wednesday morning on Core, the newly named 16-story, 292-unit apartment building coming to the middle of Silver Spring’s central business district. 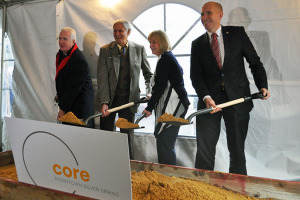 “This is an important step in the progress and the reclaiming of downtown Silver Spring for the wonderful, wonderful community that is Silver Spring,” said Bryant Foulger, managing principal of the Rockville-based developer that also helped build the Silver Spring Transit Center and the Downtown Silver Spring restaurant and retail project. “This project will be yet another step in that same type of development,” Foulger said. The project, at 8621 Georgia Ave., is schedule to be completed by spring 2017 and will be the latest new apartment project in fast-changing downtown Silver Spring. The building will include 52 affordable units and about 1,500 square feet of ground-floor retail space on a surface parking lot just north of the Lee Office Building, a well-known Silver Spring landmark at the intersection of Georgia Avenue and Colesville Road. The spot is a few blocks from the Silver Spring Transit Center, the Downtown Silver Spring project and the county’s new Silver Spring Library. County Executive Ike Leggett joined Floreen, council member Tom Hucker, who represents Silver Spring, and Richard Cohen, a Silver Spring native and chairman of Potomac-based Willco, for the ceremony.